Apple today has released iOS 4.3.1 for iPhone 4, 3GS, iPad 2, iPad, and iPod touch 4G/3G. If you upgraded to iOS 4.3.1, and now you want to downgrade back to iOS 4.3, iOS 4.2.1 or 4.1, simply follow the instructions posted below to downgrade iOS 4.3.1 on iPhone 4, 3GS, iPod touch, iPad 2 and iPad 1 to iOS 4.3, iOS 4.2.1, 4.1, 4.0.x. NOTE: This guide will only work if you have SHSH blobs saved for the respective firmware you downgrading to. Hold Power and Home buttons together for 10 seconds or so. Release Power button but keep holding the Home button until your computer recognizes a new USB device. iTunes will now recognize your iPhone, iPad or iPod touch. Note: Your iPhone, iPad or iPod touch screen at this time should be blank (black in color), if not, then you are most likely in Recovery Mode, not DFU mode. 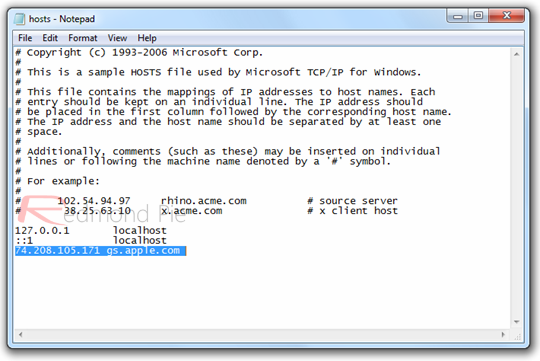 Navigate to C:\Windows\System32\drivers\etc\ and locate “hosts” file. Now simply save this file and you are good to go! NOTE for Windows 7 and Vista: Start “Notepad” with Administrator privileges by right clicking on “Notepad” app, and click on “Run as Administrator“ option. 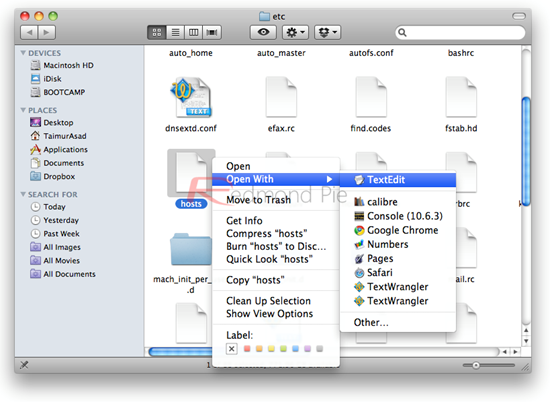 NOTE for Mac OS X: Make sure you have full read and write access on your account when you are saving the host file. If it still throws permission error, simply copy the host file to desktop, make the required changes, and then replace it with the original file in “/etc/” directory. Step 4: Start iTunes, click on your iOS device icon from the sidebar in iTunes. Now press and hold left “alt” (option) button on Mac, or Left “Shift” button if you are on Windows on the keyboard and then click on “Restore” (Not “Update” or “Check for Update”) button in the iTunes and then release this button. This will make iTunes prompt you to select the location for your iOS 4.3, iOS 4.2.1 or 4.1 firmware file. Select the desired ipsw file and click on “Open” to restore your iOS device. Now sit back and enjoy as iTunes does the rest for you. This will involve a series of automated steps. Be patient at this stage and don’t do anything silly. Just wait while iTunes installs the requested firmware on your iOS device. Your device screen at this point will be showing a progress bar indicating installation progress. Once done, it will reboot automatically. Now in some cases while restoring to iOS 4.3, iOS 4.2.1 or 4.1, iTunes might throw 1013 error at you as shown in the screenshot below. This is normal, just ignore this error as the firmware has already been successfully installed on the device. Incase of the above mentioned error, your iPhone, iPad or iPod touch will be stuck in Recovery Mode, showing that “Connect to iTunes” screen. 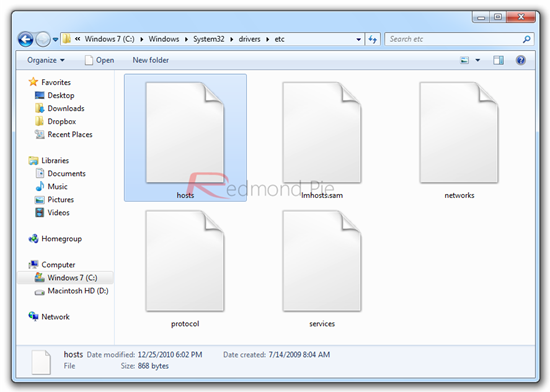 To exit your device from Recovery Mode, download this program called TinyUmbrella (Windows/Mac). Run it and the click on “Exit Recovery” button. Your device will now restart normally. That’s it, you should now be able to jailbreak and unlock your device on the older iOS 4.3, iOS 4.2.1 or iOS 4.1 firmware. 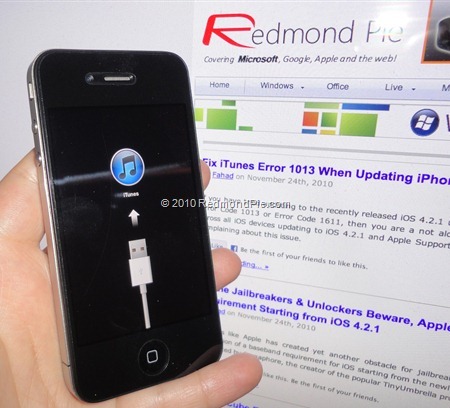 You can follow our step by step guide posted here to jailbreak your iPhone, iPad or iPod touch with Redsn0w on iOS 4.2.1 (or untethered with GreenPois0n RC5), or with Limera1n on iOS 4.1, or with PwnageTool on iOS 4.3 (Sn0wbreeze if you are on Windows) if you haven’t already. Last but not the least, you must now remove 74.208.105.171 gs.apple.com line from the host file so that you are prompted for future updates from Apple via iTunes.